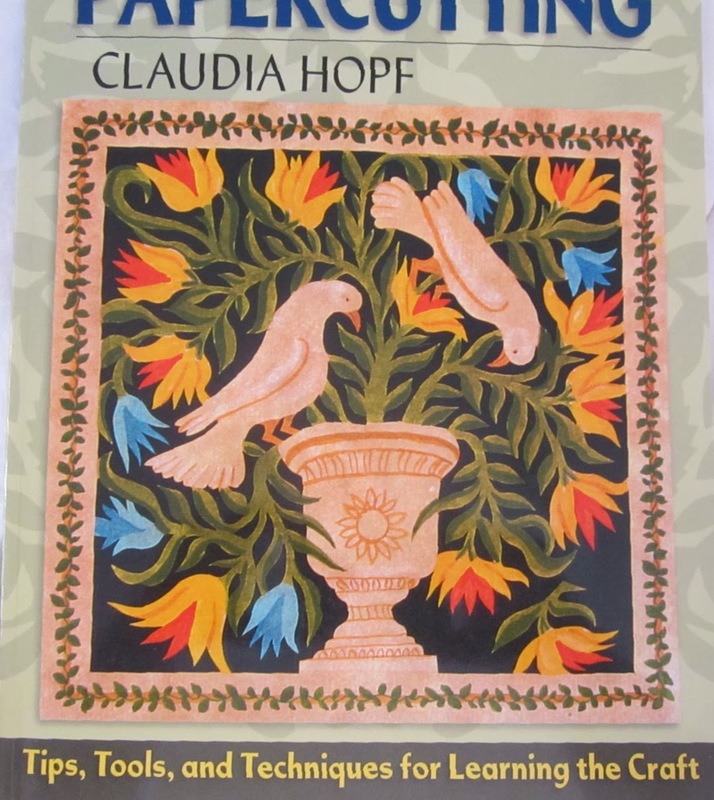 Yesterday I spent happily using the patterns from the book "Papercutting" by Claudia Hopf. My first thoughts on the book were that I would not enjoy it. The book is quite nice but I prefer paper sculpting to elaborate paper cutting. So yesterday I looked through the stash of papers and photocopied some of the patterns onto cardboard and resume papers. The first project I tried was the cover art which I increased to 125% onto parchment style resume paper. The reason for the enlargement was to make the cutting large enough to not need a knife. At first cutting was difficult but one trick offered by the author really helped. She suggested bringing the scissors up through the back of the paper. This small trick made the difference in my not throwing the cutting across the room! 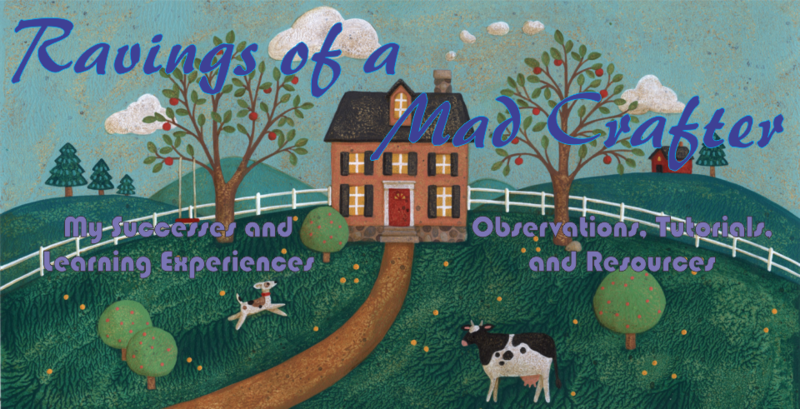 The first project I tried was the book cover art. My first try at Scherenschnitte in several years and the most complex piece I have tried. As you can see it was not a small piece, the piece took 6 hours to cut but more than half that time was spent resting my hands. 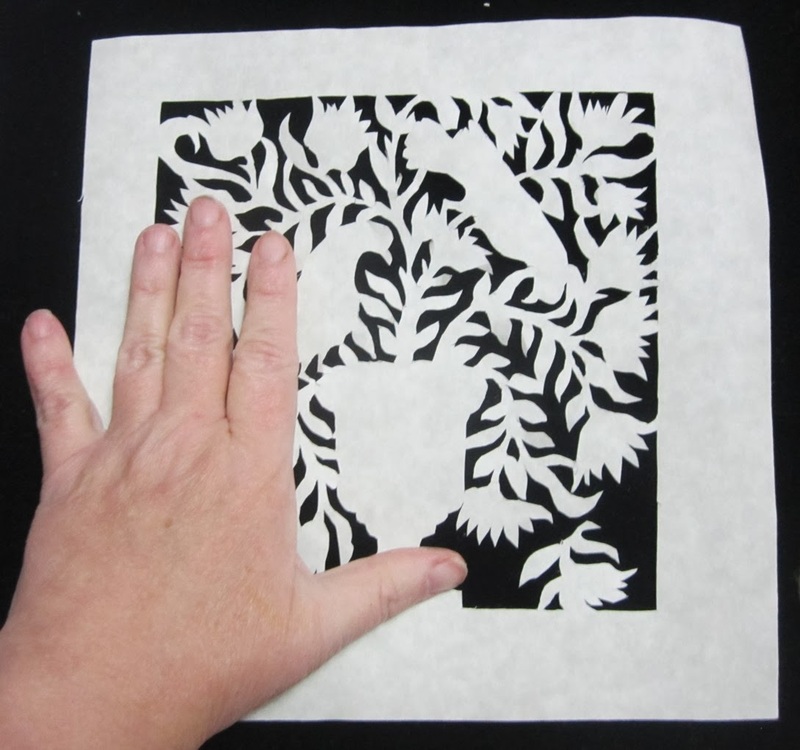 The patterns and examples in "Papercutting" are quite amazing. The history portion and gallery have a incredible variety of paper cuttings and represent many different cultures. 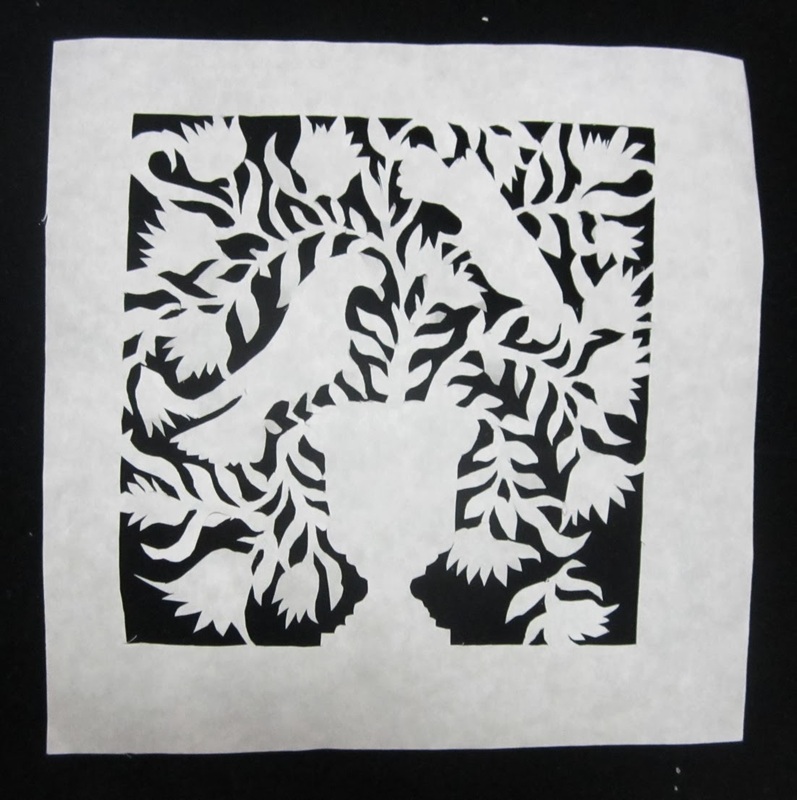 I had no idea how universal the art of paper cutting was. The thing that struck me was the use of painting the paper cutting after it was finished. I had only seen the Scherenschnitte lace that was unpainted. In the patterns section there are a few patterns with very little cutting. These simpler cuttings need to be painted in order to know the subject. Also represented in the patterns are single, double and triple folded designs. These folded designs are more like the designs that I had tried in the past. I can remember making folded paper snowflakes as a child. 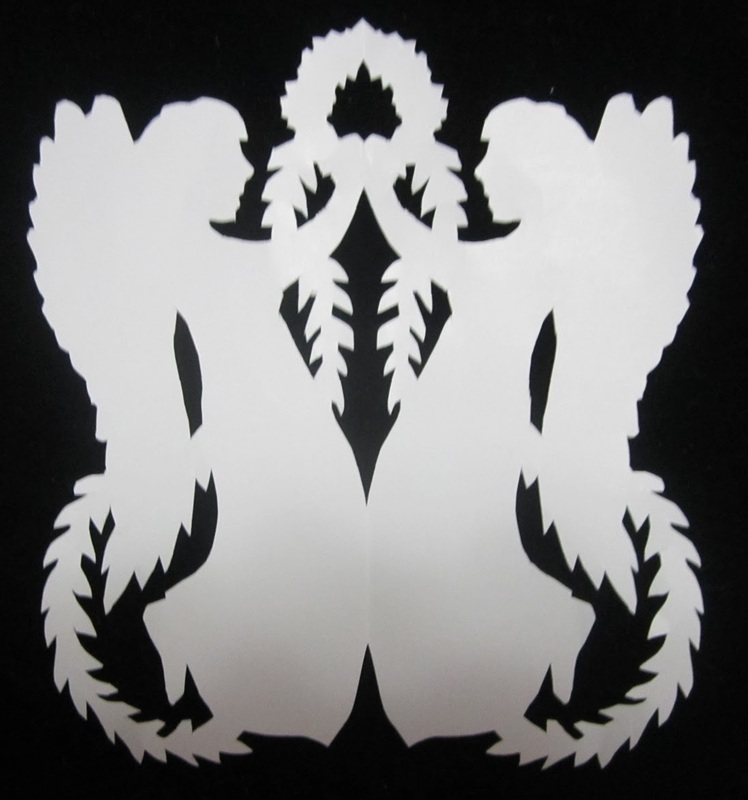 Single fold paper of angels with garland. Again I enlarged the project to avoid using a knife to cut the smaller pieces. 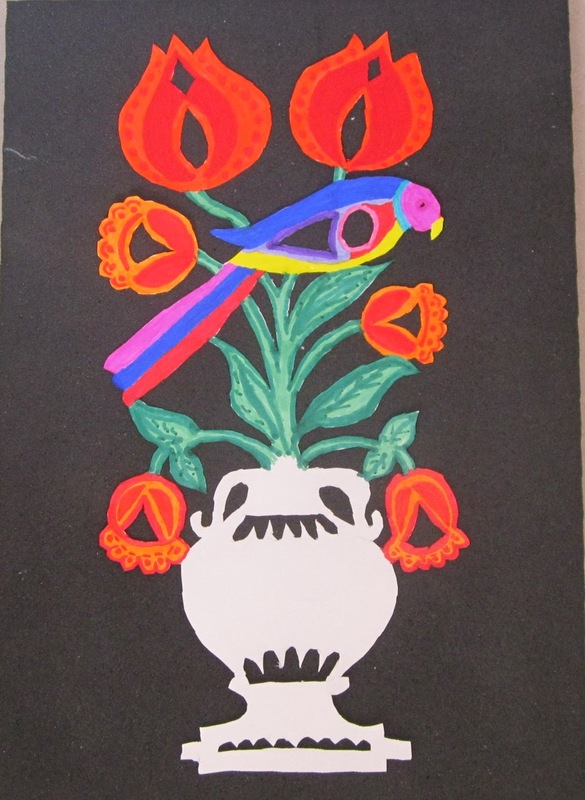 Finally I couldn't resist cutting a flower vase with tulips and parrot. 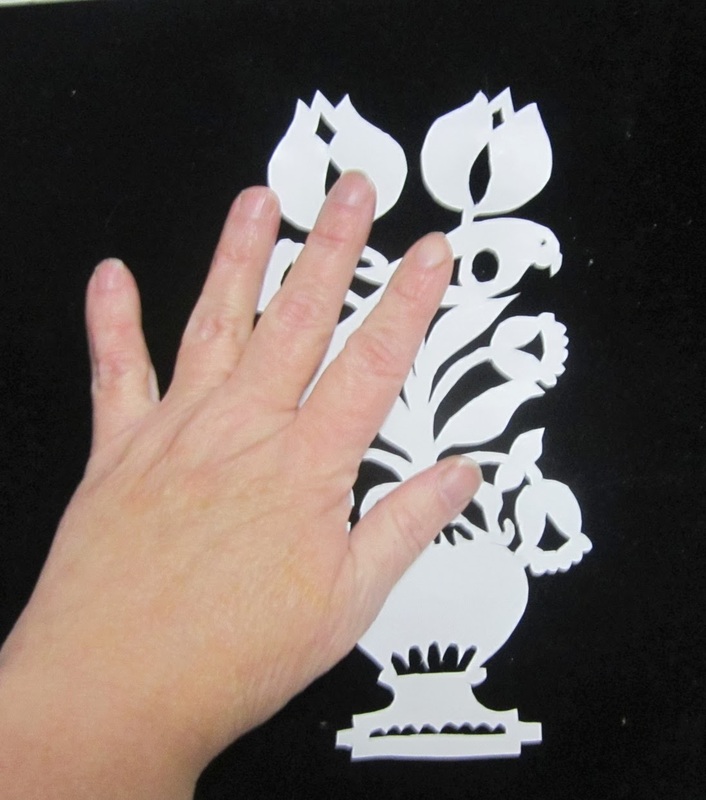 This project was very simple to cut and I didn't need to enlarge the pattern. 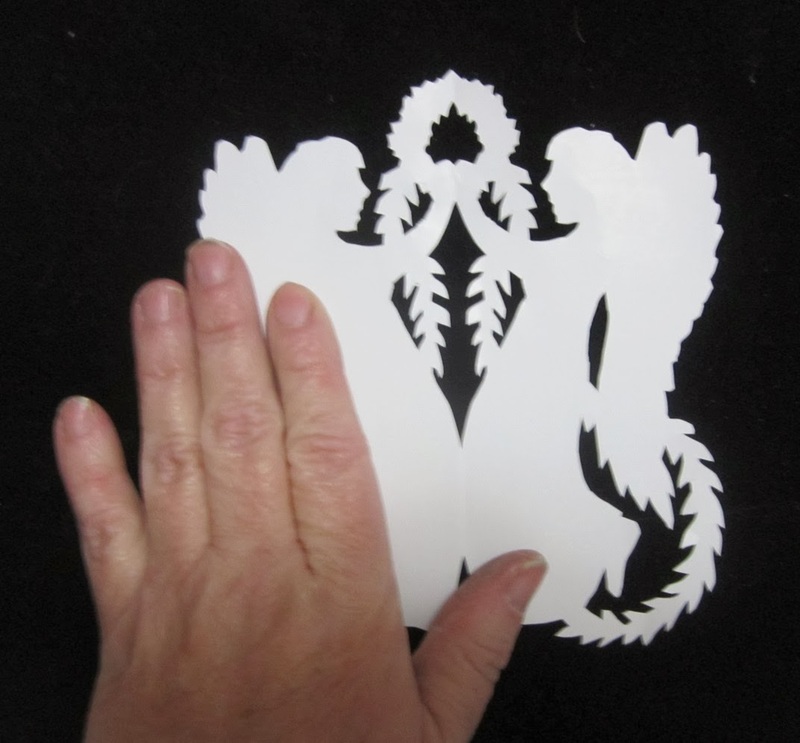 For this cutting I used a high grade inkjet printer paper with a matt finish. The hard finish on the surface made the paper perfect for cutting. 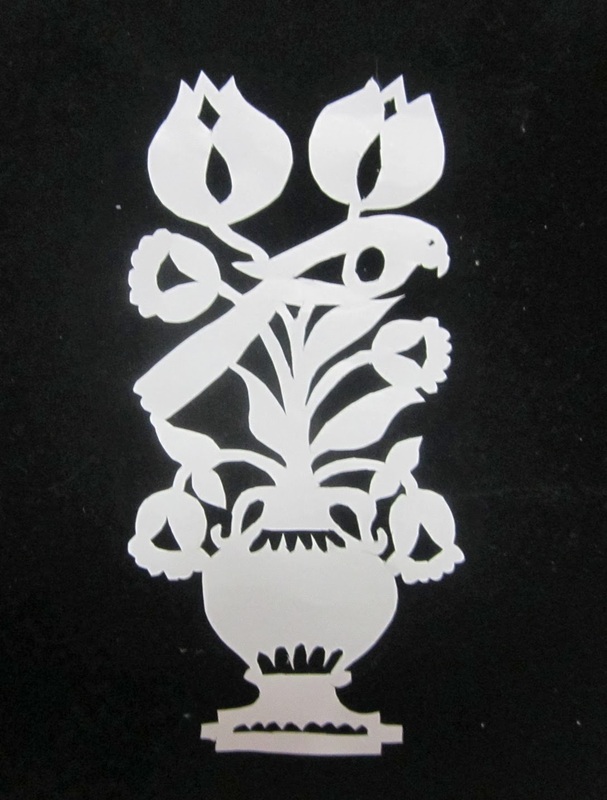 The paper was light weight and flexible enough to stand up to being cut elaborately. The cutting was then colored in with sharpie markers. The paper did not absorb the pen ink and the colors were very opaque without damaging the paper at all. Tulips and parrot in a vase. This also was a large piece to cut. The image came out very colorful. I still haven't decided on the color of the vase. I was thinking of coloring the vase with a black Sharpie pen and then use gold leaf randomly over the black. Today I plan on playing with my other new book "Creative Paper Cutting" by Cheong-Ah- Hwang. This book is much more challenging but I started the last and most complex project in the book. The project is a 3D hummingbird in flight. The project calls for making dozens of tiny feathers to cover the breast and head of the hummingbird. I only wish I was good at using tweezers, but I have the feeling I will be by the time the bird is finished. Hopefully the tweezers won't be flying around the room!